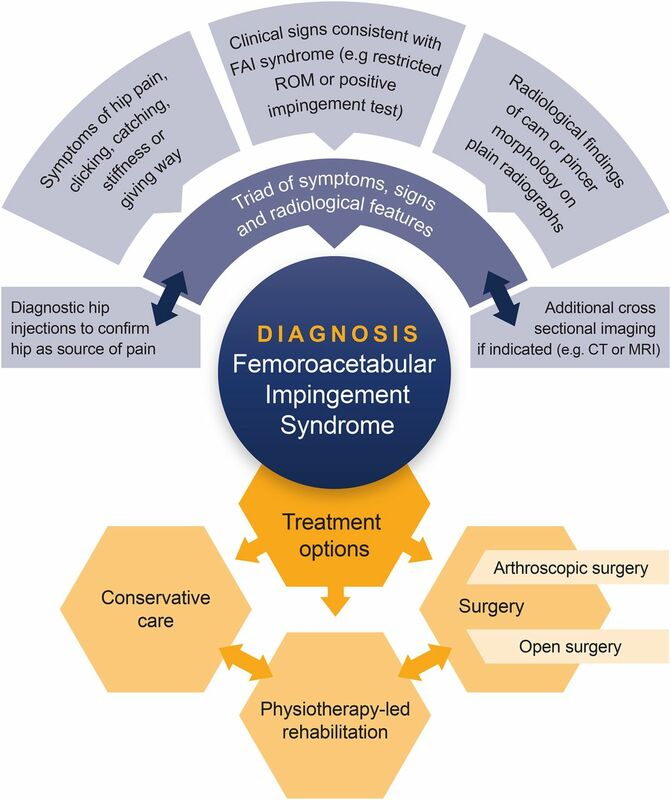 The 2016 Warwick Agreement on femoroacetabular impingement (FAI) syndrome was convened to build an international, multidisciplinary consensus on the diagnosis and management of patients with FAI syndrome. 22 panel members and 1 patient from 9 countries and 5 different specialties participated in a 1-day consensus meeting on 29 June 2016. Prior to the meeting, 6 questions were agreed on, and recent relevant systematic reviews and seminal literature were circulated. Panel members gave presentations on the topics of the agreed questions at Sports Hip 2016, an open meeting held in the UK on 27–29 June. Presentations were followed by open discussion. At the 1-day consensus meeting, panel members developed statements in response to each question through open discussion; members then scored their level of agreement with each response on a scale of 0–10. Substantial agreement (range 9.5–10) was reached for each of the 6 consensus questions, and the associated terminology was agreed on. The term ‘femoroacetabular impingement syndrome’ was introduced to reflect the central role of patients' symptoms in the disorder. To reach a diagnosis, patients should have appropriate symptoms, positive clinical signs and imaging findings. Suitable treatments are conservative care, rehabilitation, and arthroscopic or open surgery. Current understanding of prognosis and topics for future research were discussed. The 2016 Warwick Agreement on FAI syndrome is an international multidisciplinary agreement on the diagnosis, treatment principles and key terminology relating to FAI syndrome. The Warwick Agreement on femoroacetabular impingement syndrome has been endorsed by the following 25 clinical societies: American Medical Society for Sports Medicine (AMSSM), Association of Chartered Physiotherapists in Sports and Exercise Medicine (ACPSEM), Australasian College of Sports and Exercise Physicians (ACSEP), Austian Sports Physiotherapists, British Association of Sports and Exercise Medicine (BASEM), British Association of Sport Rehabilitators and Trainers (BASRaT), Canadian Academy of Sport and Exercise Medicine (CASEM), Danish Society of Sports Physical Therapy (DSSF), European College of Sports and Exercise Physicians (ECOSEP), European Society of Sports Traumatology, Knee Surgery and Arthroscopy (ESSKA), Finnish Sports Physiotherapist Association (SUFT), German-Austrian-Swiss Society for Orthopaedic Traumatologic Sports Medicine (GOTS), International Federation of Sports Physical Therapy (IFSPT), International Society for Hip Arthroscopy (ISHA), Groupo di Interesse Specialistico dell’A.I.F.I., Norwegian Association of Sports Medicine and Physical Activity (NIMF), Norwegian Sports Physiotherapy Association (FFI), Society of Sports Therapists (SST), South African Sports Medicine Association (SASMA), Sports Medicine Australia (SMA), Sports Doctors Australia (SDrA), Sports Physiotherapy New Zealand (SPNZ), Swedish Society of Exercise and Sports Medicine (SFAIM), Swiss Society of Sports Medicine (SGMS/SGSM), Swiss Sports Physiotherapy Association (SSPA). In recent years, the number of patients being treated for FAI has risen sharply in many countries.5 ,6 ,14 Clinicians, funders and health systems are concerned about this rise in a previously unrecognised condition, the costs and uncertainties of treatment, the lack of clarity of the epidemiology and the ambiguity of the diagnostic criteria. To guide patients, clinicians and funders, we convened a consensus meeting. Our aim was to reach an international multidisciplinary agreement on the diagnosis and management of FAI syndrome. We invited representatives from a range of professions and specialties to join a consensus panel. We included sport and exercise medicine physicians, physiotherapists, orthopaedic surgeons and radiologists, who are most closely involved in managing these patients. We invited people who were known to have a research interest and clinical practice in FAI syndrome, and asked professional organisations with a known interest to nominate suitable people (International Society for Hip Arthroscopy, International Federation of Sports Physical Therapy and American Medical Society for Sports Medicine). We aimed to have representation from around the world, and deliberately chose people who we knew to hold disparate views, representing as wide a spectrum of opinion as possible. In total, 22 expert clinicians and academics, and 1 patient, from 9 countries and 5 specialties, participated in the process and are the authors of this article. What future research needs to be conducted? Panel members gave presentations at Sports Hip 2016 (http://www.sportshipsurgery.org), an open meeting held in the UK on 27–28 June 2016. One hundred and fifty international delegates from a range of clinical backgrounds (surgeons, radiologists, physiotherapists and sport and exercise medicine doctors) familiar with managing young adult hip pathology attended the conference. Panel members' presentations explored each topic with an emphasis on the highest levels of evidence, from systematic reviews and randomised controlled trials where available. After each presentation, DRG chaired an open discussion where all delegates and the panel members discussed each topic. On 29 June 2016, the panel met at the University of Warwick to formulate the agreement statement. The meeting was chaired by EJD who did not express opinions during the discussion. For each topic, the chairman facilitated a structured discussion leading to a proposed wording for consideration. Panel members then voted on each proposal on a Likert scale of 0–10, where 0 reflected complete disagreement, 5 neither agreement nor disagreement and 10 complete agreement. Levels of agreement were summarised with mean scores and 95% CIs. Discussions continued until a mean score of >7.5 was reached, or until the chairman deemed that no further compromise could be found. A different approach was taken when discussing what future research is needed. Delegates at Sports Hip 2016, including panel members, were invited to suggest their opinions as to the most important research questions that need to be answered in order to improve the management of FAI syndrome. EJD and KB collated responses. We used a web-based prioritisation programme (http://www.1000minds.com) to order these research questions. This software presented panel members with pairs of research questions and asked them to choose the more important of the two. Repeated pairwise comparisons, across all panel members, led to an ordered list of research questions. During the agreement meeting, the panel used this ordered list of research questions as a basis for open discussion and development of research themes. The results of the consensus process (the Warwick International Agreement) are summarised in online supplementary file A. In the following paragraphs, we present the agreed statements for each topic or question (in shading), followed by a summary of the panel's consensus discussions. FAI syndrome is a motion-related clinical disorder of the hip with a triad of symptoms, clinical signs and imaging findings. It represents symptomatic premature contact between the proximal femur and the acetabulum. Level of agreement: mean score 9.8 (95% CI 9.6 to 10). The presence of soft-tissue damage. We felt that these definitions do not sufficiently emphasise patients' symptoms. Ambiguity as to the role of symptoms in making a diagnosis of FAI has led to the introduction of new terms such as ‘asymptomatic FAI’ or ‘radiological FAI’,35–37 apparently to describe hip morphologies rather than a clinical disorder.19 We agreed that this creates confusion when trying to define the clinical disorder. To make clear the need for symptoms to be present, the panel proposed the new term ‘femoroacetabular impingement syndrome’, or ‘FAI syndrome’.38 We considered other terms, for example, hip impingement syndrome, but preferred FAI syndrome as this did not include extra-articular hip impingement such as ischiofemoral or greater trochanteric impingement. We considered whether ‘syndrome’ might apply a negative label to patients, but the expert patient member of the panel did not feel this would be the case. To ensure that there is a distinction between patients with FAI syndrome and those with cam or pincer morphology but no clinical disorder, the panel recommends that certain terminology be used while we cease to use other terms that were considered confusing (see table 1). How should FAI syndrome be diagnosed? Symptoms, clinical signs and imaging findings must be present to diagnose FAI syndrome. The primary symptom of FAI syndrome is motion-related or position-related pain in the hip or groin. Pain may also be felt in the back, buttock or thigh. In addition to pain, patients may also describe clicking, catching, locking, stiffness, restricted range of motion or giving way. Diagnosis of FAI syndrome does not depend on a single clinical sign; many have been described and are used in clinical practice. Hip impingement tests usually reproduce the patient's typical pain; the most commonly used test, flexion adduction internal rotation (FADIR), is sensitive but not specific. There is often a limited range of hip motion, typically restricted internal rotation in flexion. Level of agreement: mean score 9.9 (95% CI 9.7 to 10). Many examination techniques and clinical signs for FAI syndrome have been described, but we agreed that there are several problems. Different clinicians apply and interpret clinical tests differently, with little consistency between professional groups or among peers.45 ,46 Even when tests are well defined, they have often been evaluated in populations with a high likelihood of a positive test,18 so their performance in a different environment (such as primary care) is not known. The most well-known test, the FADIR impingement test, is sensitive (usually positive when FAI syndrome is present), but not specific (often positive when FAI syndrome is not the correct diagnosis).18 The evidence on hip range of motion (ROM) in FAI syndrome is surprisingly contradictory,16 ,47 but the panel felt that on balance FAI syndrome is associated with a restricted hip ROM. The panel concluded that when FAI syndrome is suspected, it is important to examine gait, single leg control, muscle tenderness around the hip and hip ROM including internal rotation in flexion and the FABER distance (flexion abduction external rotation). Impingement testing should be performed, and to be positive it must reproduce the patient's familiar pain. It is essential to examine the groin for other structures that can produce similar pain. An anteroposterior radiograph of the pelvis and a lateral femoral neck view of the symptomatic hip should initially be performed to obtain an overview of the hips, identify cam or pincer morphologies, and identify other causes of hip pain. Where further assessment of hip morphology and associated cartilage and labral lesions is desired, cross-sectional imaging is appropriate. Level of agreement: mean score 9.5 (95% CI 9.1 to 9.8). The panel was unable to recommend precise diagnostic values for any of the common measures to define cam or pincer morphology in routine clinical practice. This is because we recognised that impingement is the result of a complex interaction, during motion, between the acetabulum and femoral neck. We agreed that the depth, orientation and rim of the acetabulum, and the head–neck profile, neck angle and torsion of the proximal femur all vary in the general population. It is when a particularly unfavourable combination of these characteristics occur together, along with provocative movement or position, that a patient may present with FAI syndrome. It has not been possible to capture all of this in a single measurement or even a simple set of shape criteria. What is the appropriate treatment of FAI syndrome? FAI syndrome can be treated by conservative care, rehabilitation or surgery. Conservative care may involve education, watchful waiting, lifestyle and activity modification. Physiotherapy-led rehabilitation aims to improve hip stability, neuromuscular control, strength, range of motion and movement patterns. Surgery, either open or arthroscopic, aims to improve the hip morphology and repair damaged tissue. The good management of the variety of patients with FAI syndrome requires the availability of all of these approaches. Level of agreement: mean score 9.5 (95% CI 9.0 to 10). Treatment strategies for FAI syndrome have included conservative care, rehabilitation and surgery. The panel agreed that each of these may have a role in different patients, but that there is little evidence to compare their effectiveness. Figure 1 is a suggested pathway for the management of FAI syndrome. There is currently no high-level evidence to support the choice of a definitive treatment for FAI syndrome.22 ,23 For any one patient, the panel agreed that it is appropriate to consider the different treatment options. This is best done in a shared decision-making process, supporting the individual patient to make an informed preference decision on the best treatment option for them.61 ,62 We agreed that those treating FAI syndrome, particularly in secondary and tertiary care, should be part of a multidisciplinary group with knowledge of, and access to, all the treatment options. Pathway for the management of femoroacetabular impingement (FAI) syndrome. What is the prognosis of FAI syndrome? In patients who are treated for FAI syndrome, symptoms frequently improve, and they return to full activity, including sports. Without treatment, symptoms of FAI syndrome will probably worsen over time. The long-term outlook for patients with FAI syndrome is unknown. However, it is likely that cam morphology is associated with hip osteoarthritis. It is currently unknown whether treatment for FAI syndrome prevents hip osteoarthritis. Level of agreement: mean score 9.6 (95% CI 9.3 to 9.8). All prospective cohort studies available demonstrate an association between cam morphology and osteoarthritis of the hip.73–76 These studies have not found a similar association between pincer morphology and osteoarthritis. We are unable to say whether FAI syndrome is associated with a higher risk of osteoarthritis than isolated cam morphology, but the panel thought it was likely. There is no evidence that treatment for FAI syndrome alters the risk of subsequent osteoarthritis. How should someone with an asymptomatic hip with cam or pincer morphology be managed? It is not known which individuals with cam or pincer morphologies will develop symptoms and, therefore, FAI syndrome. Preventive measures may have a role in higher risk populations, but it is rarely indicated to offer surgery to these individuals. Level of agreement: mean score 9.6 (95% CI 9.4 to 9.8). There is no evidence that treating people who do not have pain, but who do have cam or pincer morphology, will alter the risk of them developing FAI syndrome or osteoarthritis, and so it is rarely indicated to offer surgery to these people. Preventative physiotherapy-led rehabilitation and conditioning strategies may be appropriate in professional athletes where the prevalence of cam morphology is high, such as professional football teams.77 In exceptional circumstances, and in a shared decision-making process with a patient, surgery may occasionally be appropriate for high-risk patients. An example of such a patient could be an active young adult who has had surgery for FAI syndrome in one hip and in whom chondrolabral injury is seen to be developing in the other (painless) hip.78 In such cases, careful consideration must be given to the risks of surgery and its unknown long-term outcome as well as to the uncertain risks of worsening degeneration and the onset of symptoms. Which outcome measures should be used to assess treatment for FAI syndrome? Specifically designed and well-validated patient-reported outcome measures should be used to assess treatment for FAI syndrome. The international Hip Outcome Tool (iHOT), Hip and Groin Outcome Score (HAGOS) and Hip Outcome Score (HOS) are recommended. Level of agreement: mean score 9.7 (95% CI 9.4 to 9.9). The iHOT-12 and iHOT-33, HAGOS, and HOS are valid measures to assess young adults with hip joint pain. We recommend these instruments for use in clinical practice and research.33 ,34 ,79 ,80 For FAI syndrome in particular, iHOT and HAGOS were patient-derived in populations of patients including those treated for FAI syndrome, and so can be expected to perform well in this group. Both have sound psychometric properties including test-retest reliability, responsiveness, content validity, and construct validity. In addition to the hip-specific outcome measures, general quality of life instruments such as the EQ-5D, SF12/36 or PROMIS are recommended.81–83 These instruments may not be necessary for routine clinical decision-making and assessment of FAI syndrome, but they have a role in facilitating economic analyses and relative comparisons to other conditions and treatments as part of clinical research and health policy development. The delegates at Sports Hip 2016 proposed 118 research questions about the diagnosis and management of FAI syndrome. During the consensus exercise, we identified 23 substantially different questions, which were ranked in order of priority by the panel (see online supplementary file B). The panel grouped the questions into four categories: aetiology, diagnosis, prognosis and effect of treatment. Regarding aetiology, there was considerable interest in how cam and pincer morphologies develop, whether sporting activity in childhood may influence this, and why some patients develop symptoms and others do not. For diagnosis, we agreed that diagnostic criteria are imprecise and need to be improved, and that the utility of those we have is unclear. We would benefit considerably from better information on the long-term natural history of FAI syndrome, though the panel recognised that significant resources are needed to perform the necessary long-term prospective studies. Finally, there is an urgent need to compare the effectiveness of conservative, rehabilitation and surgical treatment strategies. Fortunately, several such studies are in progress (see table 2), and results will begin to appear in the next few years. We provide an international, multidisciplinary agreement statement on FAI syndrome. Key messages from this agreement are summarised in a linked infographic.84 The term ‘FAI syndrome’ emphasises the fact that the patients in discussion are symptomatic, suffering from a clinical disorder that is characterised by a triad of symptoms, clinical signs and radiological findings. The authors wish to acknowledge Michelle Hall for her help in identifying the relevant systematic reviews for each topic, and Rachel Hobson and James Griffin for their support in running the meeting.
. Treatment of malum coxae senilis, old slipped upper femoral epiphysis, intrapelvic protrusion of the acetabulum, and coxa plana by means of acetabuloplasty. J Bone Joint Surg Am 1936;18:869–80.
. Movement patterns during a small knee bend test in academy footballers with femoroacetabular impingement (FAI). Health Sci Working Papers 2014;1:1–24.
. Studies on dysplastic acetabula and congenital subluxation of the hip joint: with special reference to the complication of osteoarthritis. Acta Chir Scand 1939;58:135.
. Femoroacetabular impingement: what happens (in the short term) with no treatment? St Georges Park, UK: Sports Hip, 2016.
. The Patient-Reported Outcomes Measurement Information System (PROMIS) developed and tested its first wave of adult self-reported health outcome item banks: 2005–2008. Journal of clinical epidemiology 2010;63(11):1179–94.
. Development and testing of the UK SF-12. J Health Serv Res 1997;2:14–18.
. Infographic. The Warwick Agreement on femoroacetabular impingement syndrome (FAI syndrome): an international consensus statement. Br J Sports Med 2016;50:1169–76. Contributors DRG, JO, KB, RH and EJD had the idea to perform this study and identified potential panel members. DRG, EJD, KB and JO designed the study. EJD collected and distributed the bibliography, coordinated the development of topics and chaired the consensus meeting. All authors contributed to the development of the content of the agreements statement by participating in the meeting or discussions afterwards and voted to indicate their agreement. DRG and EJD wrote the first draft of the paper; all authors helped edit the manuscript and approved the final version. Funding This project was partially funded by the National Institute for Health Research (NIHR; Health Technology Assessment programme; 13/103/02) and by a research grant from the International Society of Hip Arthroscopy. Disclaimer The views and opinions expressed therein are those of the authors and do not necessarily reflect those of the Health Technology Assessment Programme, NIHR, National Health Service (NHS) or the Department of Health. Competing interests See online supplementary file C.